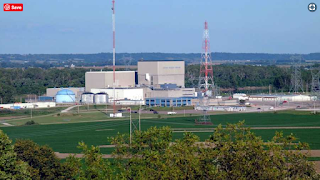 Nuke Pro: Cooper Nuclear At Flood Levels But It Refuses to Shut Down, Too Much Money to Lose! Cooper Nuclear At Flood Levels But It Refuses to Shut Down, Too Much Money to Lose! We saw this in Texas and Florida last year. After a 12 year dearth of land falling hurricanes, we need to get ready to get back to average. With cooling temperatures, they may not have as much energy, but there will still be disasterous outliers. Nuclear refuses to shut down, until the last minute, when it is most dangerous, and everything is still really hot. Increasing melt down and Trillion dollar disaster risk. The plant goes offline when levels on the Missouri River hit 45 feet. As of 10:15 a.m. Saturday, the river was at 45.64 feet in Brownville, according to the National Weather Service. Oh, but they "have their own gauge". Oh, and per the story below, don't worry, they are "adding sand bags" to protect the nuclear plant. Did I just read that, type that? Even 2 days ago, they predicted a shutdown, and report that it is the Brownsville gauge that they use. I question the skills and knowledge of the Nuke plant spokeseman, who also stated that they "pull the fuel rods", which is completely false. Of course, this is after all, Washington Post.